Calling all Papa Johns and/or free pizza fans! 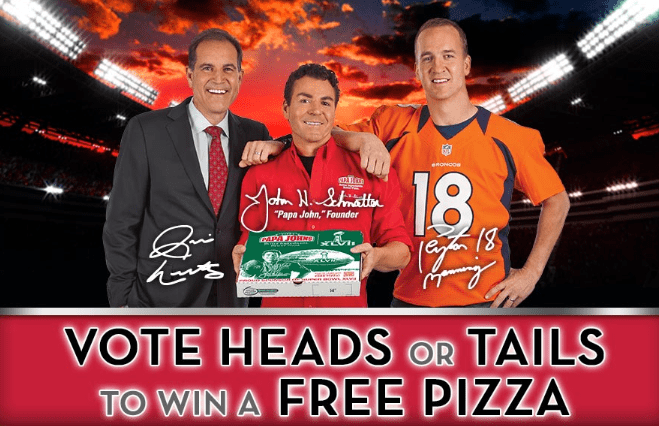 Papa Johns is doing their free pizza giveaway for the Superbowl if you pick the coin toss correctly! Last year, America picked the coin toss where we all either won or lost together, and we all won! This year, it is up to you. So choose wisely. You must make vote online by Saturday, February 2, 2013 over here. If you choose correctly, watch your e-mail for a promo code for a free 1-topping pizza on Monday! (Remember, to check your spam). You can only vote once, but up to 4 members in a household can vote. So make a pact with your mother, spouse, roommate or whoever to split a free pizza depending on where the toss lands! Good luck!